When you buy something in a store, you need to check out to pay. eBay isn’t much different. eBay’s Checkout is a convenient way to pay for your completed auctions and Buy It Now sales with a credit card or eCheck through PayPal. Checkout is integrated directly onto the item page so that you can win and pay for an item in less than a minute. 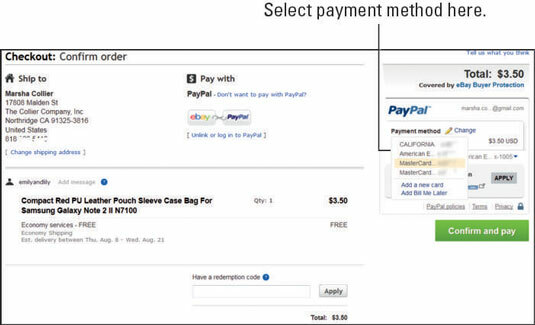 You may also be forwarded to a link to the seller’s Checkout page if the seller uses a third-party Checkout system. When an auction is over, the item page will have Checkout information. When you click the Pay Now button, you’re taken through the Checkout process. You pay for the item, and the seller is notified. You also get an e-mail confirming your payment, along with the seller’s e-mail address. If you don’t have a balance in your PayPal account (from selling items), PayPal defaults to taking the payment from your registered bank account. If you prefer to pay with a credit card, you must find the link to change your payment method. If you’re dealing with a Buy It Now or fixed-price listing, the page won’t change much after you’ve purchased the item. After you commit to buy and confirm to eBay that you want to make a purchase, you’re taken immediately to a page with a Confirm and Pay button.